The IDS 1000 in-situ dissolution system with fiber optic technology brings direct measurement technology to dissolution testing. Sample measurement is automated and self-contained, there is no need for samples to be pumped out of the dissolution vessels at all. The IDS 1000 includes an automated tablet drop magazine for the synchronous release of up to eight samples. The built-in vessel covers close the dissolution vessel completely, reducing evaporation to a minimum. The vessels are arranged in a 4 + 4 configuration, stirring speed, temperature and stirrer immersion position can be set using the WinDiss ARGUS software. IDS or In situ Dissolution System is about the application of direct measurement technology to Dissolution Testing. Traditionally, dissolution testing has been carried out on solid dosage forms using a standard dissolution tester. 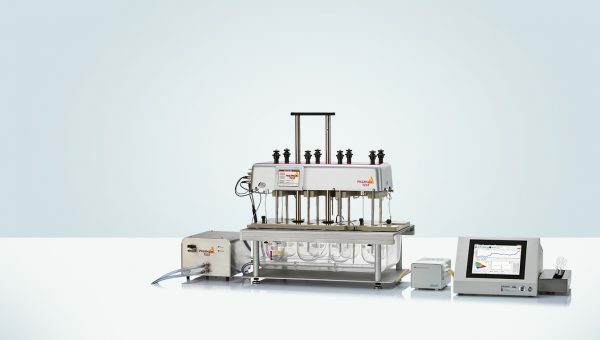 Samples of the dissolving active within the dosage form are taken for estimation from the dissolution tester either manually, or using more automated means such as a pump which has been connected to a suitable measurement device, usually a UV Spectrophotometer. Using IDS 1000, not only can the whole process of sample measurement be automated, but can also be self contained, such that there is no need for samples to be pumped out of the dissolution vessels to external measurement facilities such as a spectrometer, because all that is needed for the measurements to be made is contained within the confines of the instrument itself. 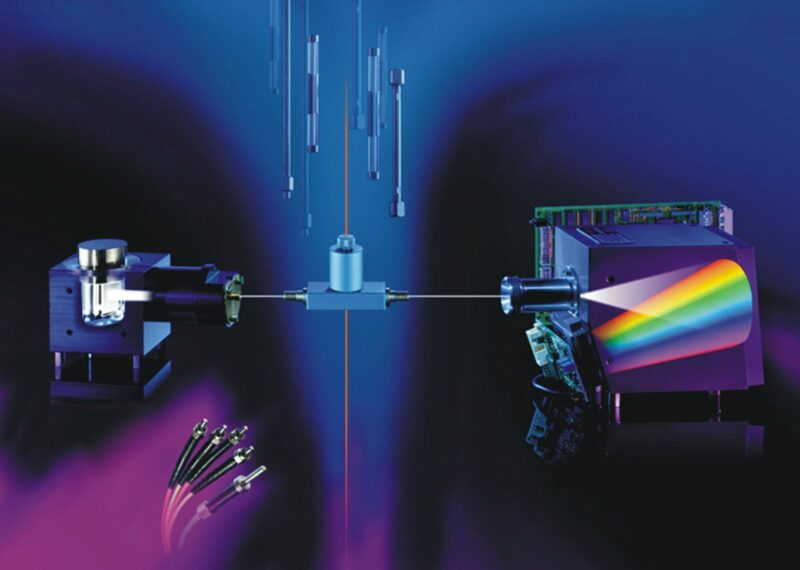 The fiber-optic DAD spectrometer with multiplexer is integrated in the instrument head. In the first instance the introduction of tablets or other dosage forms is as with a conventional dissolution instrument using a synchronous tablet drop magazine. The instrument is started according to the WinDiss32 Dissolution Software control, but the sampling sequences have been replaced by direct measurement technology within the dissolution vessel itself, with each measurement cycle accomplished in seconds rather than minutes. The in-situ measurement is performed by fiber optic probes which are located in the centre of the stirring shafts of the dissolution tools, i.e. paddle or basket (USP App. 2 or 1). The fiber optic probe can be removed from the shaft so that various path length inserts can be employed for different active concentrations and extinction coefficient ranges. This system is different for many reasons and brings a really new dimension to dissolution measurement. For example the fiber optic probes are easily accessible and can have various cell paths attached. In situ probe placement means fast measurement times and no fluid circulation. No more pump tubing to be qualified or fail during a dissolution run. It also means that there is no fluid perturbation inside the vessel from sampling probes as used in conventional measurement cycles. It is also different from other instruments, in which attempts have been made to use fiber optic measurements, as this system has only one built in diode array spectrophotometer, but is still able to operate with 9 separate fiber optic sensor paths which are multiplexed to a central sampling unit. The biggest difference is that all IDS 1000 components, including the built-in Diode Array spectrophotometer are contained in a single housing, so that all optical components have a fixed geometry. This coupled with no externally pumped liquids not only allows us to have very fast sampling sequences (useful for fast disintegrating and fast dissolving actives) but also means that the system does not contain unnecessary hardware, whilst still offering the advantage of a self-validation routine (SST or System Suitability Test) for all the on-board measurement hardware. This validation routine is activated before the start of each analysis. 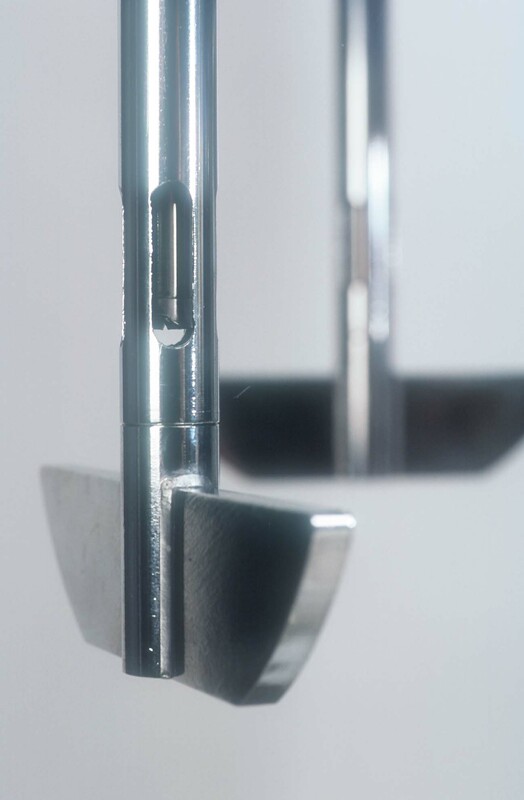 The combination of self-validation, speed, precision and no external fluid circulation are very attractive options. The built in Diode Array Spectrophotometer also means that single wavelength measurements are no longer made, but whole spectra may be accumulated to optimize the analytical wavelength used. This also allows the use of first derivative techniques in order to analysis multi-component formulations with overlapping absorption curves. Today the instrument operator of such instruments expects not only conformity with the pharmacopoeia requirements, but also easy operation and accessibility to the test vessels. This means a dissolution bath should offer both good manual access as well as automation facilities. The IDS 1000 offers both. 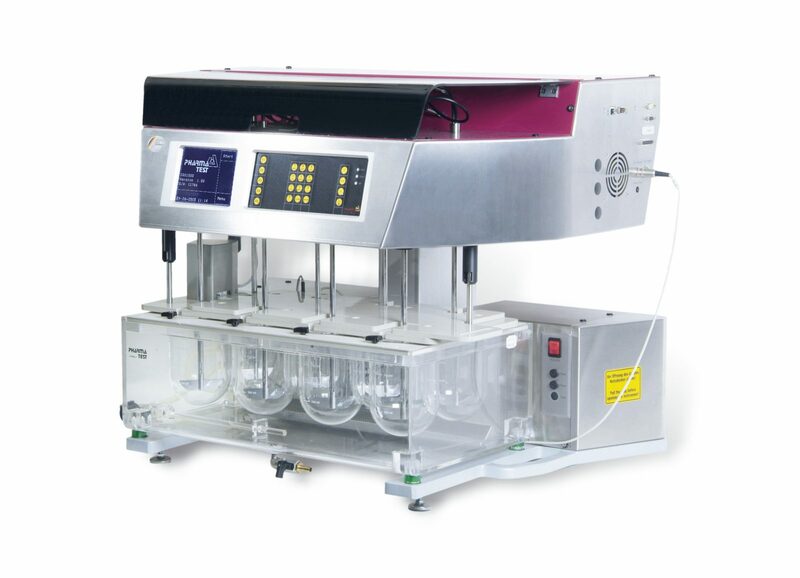 All test vessels are placed in a 4 + 4 line-up so that it is easy to remove spent samples and refill with medium. The clear-view Plexiglas water bath sits on vibration absorbing feet as does the built-in circulation pump. There are external temperature probes to better control both bath and medium temperature. The depth setting of the stirrers is programmable. In fact 8 tool depth positions can be selected to meet all settings required for different test tools such as Paddles, Baskets, Transdermal Cylinders and so on. The PHARMA TEST IDS 1000 In-Situ Tablet Dissolution Tester exceeds all technical requirements which are currently described in the USP <711/724>, FDA, EP <2.9.3/4> and German Pharmacopoeias. The special design, in which the pump and heating system (as well as the mains electronic boards) are accessible without having to move the instrument, coupled with the fact that the water bath is placed on vibration absorbers virtually eliminates any vibration transfer and offers easy maintenance facilities. The built-in circulation pump is specially isolated for absolute vibration free operation. The measurable vibration is even lower than that of systems which use a separate heating circulator system that is placed to the same bench. The electronic control system monitors water level, pump flow, stirrer speed and temperature. A complete new design of detector and optics is implemented inside the IDS 1000 F/O Dissolution Test System. The result is a spectrophotometer which is optimized for the use of fiber technology offering state of the art performance. 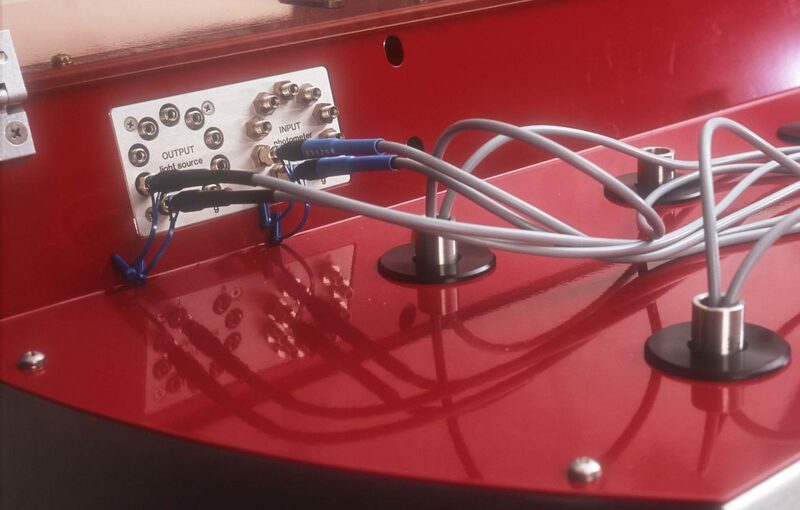 Combined with a 9-channel multiplexer it is possible to acquire 8 channels with fiber probes directly inserted to the hollow shafts of the vessels. 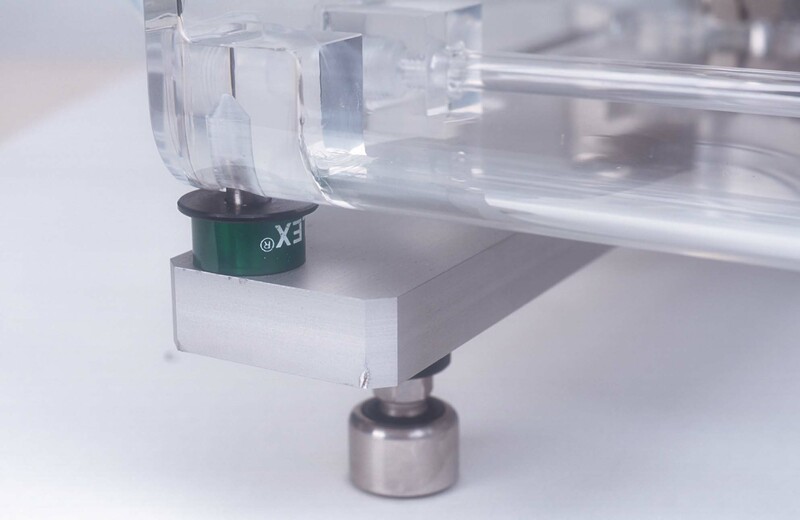 The ninth channel allows reference measurement for each measurement cycle and boosts the instrument performance to a real double beam spectrophotometer. With respect to maintenance and service all components are easily accessible. It guarantees highest demands on robustness and reliability. The inbuilt solution inside the IDS 1000 reduces footprint and offers highest comfort for complete system validation. WinDiss ARGUS is a revolutionary scientific dissolution data management software tool for instrument control and advanced data acquisition, management, processing and reporting – designed by users for users. Whether you perform dissolution tests occasionally or several times each day WinDiss ARGUS will make you more productive in running tests and analyzing results. WinDiss ARGUS simplifies how you collect and report dissolution test results by letting you choose the analysis template that matches the way you work. Whether you are in a QC department concerned about data security, compliance and validation, or need maximum ﬂexibility in the R&D area, WinDiss ARGUS can help your lab to perform more efficiently. Intuitive wizards help anyone in your lab work better – your next dissolution test is running in just a few clicks. Qualify the 25mm position for paddles and all other tools are automatically in correct working position. SST, System Suitability Test prior to the start of an analytical sequence. Easy access to lamp and power supply – without having to physically move the bath or the housing of the complete test equipment. Supports service and maintenance in an efficient way. A special highlight is the possibility of high speed kinetic measurements at a free selectable channel with up to 50 spectra per second. In-situ measurements reduce error impacts by sample transportation inside tubes and pumps. Wavelength stability and reproducibility allows to measure absorbance values also at the slope of the signal. There is no necessity to measure always in the peak maximum. State of the art design and functionality. Produces no additional noise or drift! Address all channels in less than 5 seconds. Sample Analysis UV Diode Array spectrophotometer incl. multiplexer to select 8 positions and a reference cell, wavelength range 190 – 610 nm, resolution 0.8 nm/Pixel; long term stability and wavelength accuracy <0.1nm; integrated Halogen and Deuterium lamp.